You can download a PDF of this testimony by clicking here. The Institute for Energy Research (IER) is a not-for-profit organization that conducts intensive research and analysis on the functions, operations, and government regulation of global energy markets. IER maintains that freely-functioning energy markets provide the most efficient and effective solutions to today’s energy and environmental challenges and, as such, are critical to the well-being of individuals and society. Founded in 1989 from a predecessor nonprofit organization, IER is a public foundation under Section 501(c)(3) of the Internal Revenue Code and is funded entirely by contributions from individuals, foundations and corporations. Headquartered in Washington, D.C., IER supports public policies that simultaneously promote the welfare of energy consumers, energy entrepreneurs, and taxpayers. Robert Murphy earned his Ph.D. in economics from New York University in 2003. From 2003 – 2006 he taught economics at Hillsdale College. After three years teaching, Murphy left academia for the private sector, taking a job with Laffer Investments, headed by Arthur Laffer of “Laffer Curve” fame. In this capacity, Murphy maintained and improved stock selection models, and also helped write research papers for clients. One of the Dr. Laffer’s main interests in this period was oil prices. In the summer of 2007 Murphy joined IER as an economist. His academic research has focused on climate change economics, specifically the proper discount rate to use when evaluating mitigation policies. He has also given several public presentations on the oil industry, dealing with such issues as record oil prices, windfall profits taxes, and offshore drilling. In addition, Murphy has prepared studies for IER dealing with oil and food prices, the effects of ethanol on gasoline prices, and the role of institutional speculation in oil prices. 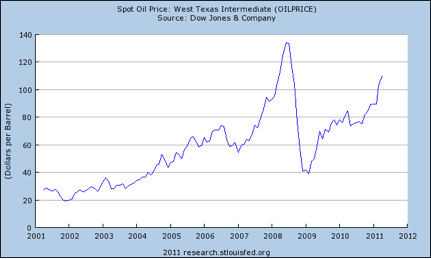 Murphy previously testified (having been invited by Dr. Ron Paul [R-TX]) on the connection between the weakening dollar and oil prices on July 24, 2008. If policymakers want to reduce prices at the pump, the two most relevant components of gasoline prices are federal and state taxes, as well as the price of crude oil. Federal policymakers clearly have the ability to lower the federal tax of 18.4 cents per gallon, while state officials could lower the respective fuel taxes in their jurisdictions. This would provide immediate relief at the pump, though depending on (what economists call) the relative elasticities of supply and demand, not all of the tax reductions would be passed along to motorists. 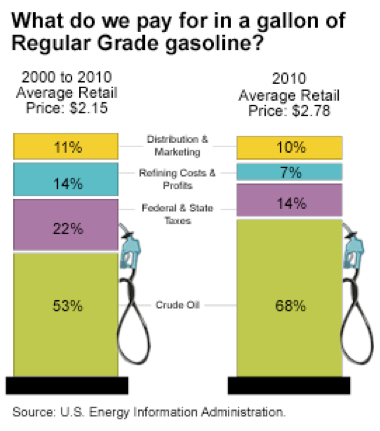 For a purely illustrative example, even if the 18.4 cents per gallon federal tax were completely eliminated, the price at the pump might only fall by (say) 10 cents per gallon, meaning that retailers would earn an extra 8.4 cents per gallon themselves. Moving on to the price of crude oil, at first it might seem as if federal policymakers have little influence on a commodity traded in the world markets. However, by expediting the development of offshore and other mineral resources on federal lands, policymakers could signal an increased future output of crude oil which would actually reduce prices even in the present. For example, when President George W. Bush announced in the summer of 2008 that he was ending the executive branch’s moratorium on offshore drilling, the price of oil dropped $9 during the speech itself. In addition—and of more relevance to this hearing—the Federal Reserve has a tremendous influence on the value of the dollar and the financial markets, and as such may have played a significant role in the sharp run-up in crude oil prices over the last few years. There are two main routes through which Fed policy could have influenced oil prices (quoted in dollars). First, the Fed could have caused the dollar to depreciate against other currencies. Second, the Fed could have raised the price of oil relative to most other goods and services. In the remainder of this written testimony, I will first lay out the extraordinary interventions of the Federal Reserve in the wake of the financial crisis, and then turn to each of the two possible connections to oil prices. As the above chart indicates, from the creation of the Fed in late 1913 up until September 2008, the monetary base grew by a little more than $932 billion. 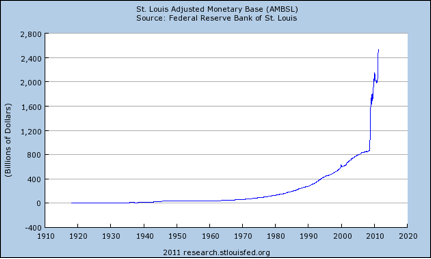 From September 2008 until the present, the monetary base has grown by an additional $1,595 billion. The Federal Reserve has clearly embarked on unprecedented injections of liquidity into the financial system during the last few years. Crude oil is traded on a world market. If the dollar falls against another currency, such as the euro, then either the euro-price of oil has to fall, or the dollar-price of oil has to rise, to eliminate arbitrage profits. 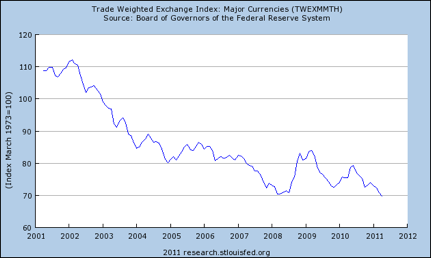 From its peak in March 2009, the dollar has fallen 17 percent against other major currencies. Therefore, holding everything else constant, the dollar deprecation alone from early 2009 can explain a 20.5 percent increase in oil prices (quoted in dollars). Put differently, the oil price quoted in (say) Japanese yen has not risen as much since early 2009 as it has in U.S. dollars. It is on the basis of such calculations that a recent Joint Economic Committee report estimated that Federal Reserve policies have added almost 57 cents to the price of a gallon of gasoline for American motorists. However, this calculation assumes that the entire drop in the value of the dollar (relative to other currencies) since the announcement of the first round of “quantitative easing” (in late 2008) has been due to investor concern over U.S. inflation. One could plausibly argue that the retreat from the panic of that period has also led investors to shift some of their wealth away from U.S. Treasury debt and into riskier assets, thus reversing the sharp increase in the exchange value of the dollar that began earlier in September of 2008. In a sense, both perspectives attribute the fall in the value of the dollar to the actions of the Federal Reserve, but the latter interpretation (that the Fed averted a financial meltdown) is of course less critical than the former (that the Fed debased the dollar). In either case, the JEC estimate of the Fed’s impact on gasoline prices only looks at the direct mechanism of monetary policy’s influence on the exchange value of the dollar relative to other currencies. The JEC analysis does not consider the possible role the Fed has played in pushing up oil and other commodity prices, regardless of the currency in which they are quoted. In addition to causing oil prices (quoted in dollars) to rise because of a weakening dollar, Federal Reserve policy may also affect oil prices more directly to the extent that it has caused investors to shift some of their wealth into commodities as an “inflation hedge.” For example, since September of 2008, gold and silver prices have increased some 80 percent and 210 percent, respectively. A certain segment of investors and the general public are very concerned about the future purchasing power of the dollar, and have invested in the precious metals to protect themselves from potentially large future price inflation. More generally, some investors may be turning to other commodities (including oil) thinking that they will provide a relatively safe store of value, in the event that the dollar and other paper currencies weaken in the future. However, although this theory has a surface plausibility, in practice it is difficult to distinguish it from an explanation that oil’s price rise is due to “the fundamentals,” i.e. a genuine growth in end-user demand for oil relative to the increase in output. As the above diagram indicates, if the actual spot market price were being held above the “fundamental” price, then producers ought to be increasing output while end users (such as oil refiners) would cut back on their purchases. 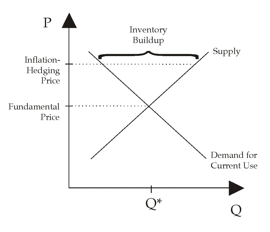 The excess output over current consumption would then go into inventory accumulation. Through mid-July 2009, there was evidence of a large-scale inventory buildup in crude oil. On July 8, 2009, Paul Krugman wrote that although he thought the run-up in oil in the summer of 2008 had been due to fundamentals, the price rise in the first half of 2009 was associated with bulging inventories in both tankers and conventional storage, suggesting that investor behavior in the futures markets could be partially responsible this time around. However, the trend reversed in the second half of 2009. Looking at the entire period, official U.S. inventories of crude oil and petroleum products as tracked by the EIA as of February 2011 were 36.7 million barrels higher than in December 2008, an increase of a little more than 2 percent. Thus inventories in the United States have grown, but the growth alone is hardly enough to explain the huge increase in the price of oil over the period in question. Although there is no “smoking gun” in U.S. data, it is important to note that worldwide oil inventories are much harder to estimate. Only the OECD countries provide regular reporting on inventories to energy agencies. A potentially large source of error is China, which has been aggressively building strategic petroleum storage capacity while not being transparent as to exactly how much of its “oil demand” is actually being diverted into stockpiles, rather than being consumed. Besides storing oil above ground, another mechanism through which the actual market price could be held above the “fundamental” price would be a cutback in production. In effect, the owners of oil fields would be stockpiling inventory out of regular output underground. The possibility of constrained output leading to the run-up in world price is consistent with the behavior of OPEC nations, as they have kept their official production quotas at the curtailed levels implemented after the global economic slowdown in late 2008, even as the world price recovered from its brief collapse. However, even though OPEC nations have constrained their production, output from other sources has more than compensated for the gap. Overall, estimated total world output of oil in the first quarter of 2011 was the highest ever. The Federal Reserve has engaged in unprecedented interventions in the financial system in the wake of the 2008 financial crisis. To the extent that the Fed’s actions have caused the U.S. dollar to fall against other currencies and led some investors to seek commodities as a hedge against price inflation, the U.S. central bank is partially responsible for the large run-up in oil prices since early 2009. However, it is very difficult to isolate just how much of the price hike can be explained by Fed policy, versus “fundamental” factors such as the fall in Libyan production and the increasing oil demand from emerging markets. Absent very reliable worldwide data on inventory accumulation, the relative influence of monetary policy versus “real” factors specific to the oil market cannot be precisely quantified. If policymakers want to lower the price of gasoline for American consumers, they have several options. Most obvious, they could reduce federal and state gasoline taxes. They could also expedite the regulatory and permitting process for the development of offshore and other domestic oil resources. Finally, with respect to the Federal Reserve, to the extent that a tighter monetary policy would strengthen the dollar and reduce investor concern about future price inflation, we would see lower crude oil prices and hence lower gasoline prices. It is notoriously difficult though to estimate the quantitative impacts of these policies, because market prices are influenced by so many different factors. See Robert Murphy, “Ending Permitorium Could Reduce Oil Prices More than Reducing SPR,” IER blog post, March 25, 2011, available at: https://www.instituteforenergyresearch.org/2011/03/25/ending-permitorium-could-lower-oil-prices-more-than-reducing-spr/. Oil history from EIA: http://www.eia.gov/dnav/pet/hist/LeafHandler.ashx?n=PET&s=RCLC1&f=D. Accessed May 20, 2011. Exact figures available at: http://research.stlouisfed.org/fred2/data/AMBSL.txt. Accessed May 20, 2011. Exact figures available at: http://research.stlouisfed.org/fred2/data/TWEXMMTH.txt. Accessed May 20, 2011. If the dollar had fallen by 50 percent against other currencies, then (all else equal) the oil price quoted in dollars would have doubled. A drop of 17 percent would thus yield a (1 / 0.83) ≈ 1.205 factor increase in the price of oil. 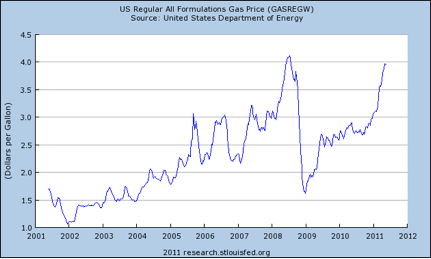 “The Price of Oil and the Value of the Dollar,” May 16, 2011, Joint Economic Committee. Available at: http://jec.senate.gov/republicans/public/index.cfm?p=PressReleases&ContentRecord_id=b0772383-bdb9-4ee8-af50-26c68f10aa8d. Accessed May 20, 2011. The (rough) estimates of gold and silver price appreciation were obtained by viewing the historical charts at http://kitco.com. See Paul Krugman, “Oil speculation,” July 8, 2009, available at: http://krugman.blogs.nytimes.com/2009/07/08/oil-speculation/. Accessed May 20, 2011. Crude oil and petroleum products stock data available at: http://www.eia.doe.gov/dnav/pet/hist/LeafHandler.ashx?n=PET&s=MTTSTUS1&f=M. Accessed May 20, 2011. See Yan Pei, “China accelerates filling strategic oil reserves,” China.org.cn, July 21, 2010, at: http://www.china.org.cn/business/2010-07/21/content_20545379.htm. Accessed May 20, 2011. The EIA’s Short Term Energy Outlook interactive tables are available at: http://www.eia.gov/emeu/steo/pub/cf_tables/steotables.cfm. Accessed May 20, 2011.